In 1-quart saucepan, mix apricot preserves, 1 tablespoon lime juice and the mustard. Cook over low heat, stirring occasionally, just until preserves are melted. Refrigerate while making shrimp. Move oven rack to lowest position. Heat oven to 425°F. Spray rack in broiler pan with cooking spray. In shallow bowl, mix flour, brown sugar, salt and red pepper. In another shallow bowl, beat egg and 1 tablespoon lime juice. In third shallow bowl, place coconut. 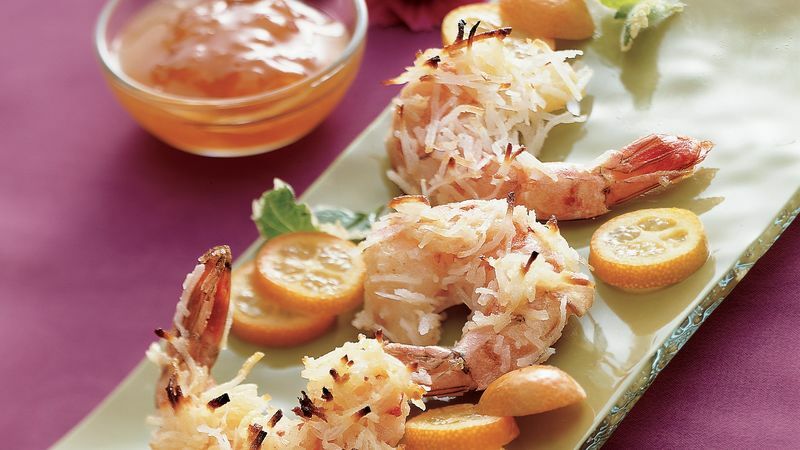 Coat each shrimp with flour mixture, then dip each side into egg mixture and coat well with coconut. Place on rack in broiler pan. Drizzle with butter. Bake 7 to 8 minutes or until shrimp are pink and firm and coating is beginning to brown. Serve with preserves mixture. Prepare the shrimp up to 2 hours ahead of time. Refrigerate covered, and bake just before serving. Serve these terrific low-fat appetizers with purchased cocktail sauce.